The latest James Bond actor Daniel Craig says he is focused on making the next movie in the franchise despite the stinging criticism he has faced. 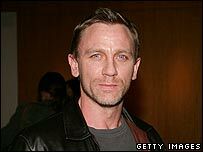 A small band of fans has called for a boycott of Casino Royale because they do not agree with the casting of Craig. "I've been trying to give 110% from the beginning and maybe after that (the criticism), I was trying to give 115%," said Craig. "You go mad if you believe any of it," he added. "You can't believe the good stuff. You can't believe the bad stuff. You kind of just take it in. But I'm focused on making this film." Craig admitted he had damaged a tooth during filming in the Bahamas but it did not halt production, as had been claimed. He also dismissed rumours he could not drive a manual car. "You go mad if you believe any of it (the criticism)," he said. "The truth is if you don't get bruised doing Bond, you're not doing it properly." Craig replaces Pierce Brosnan as one of cinema's most iconic characters. Brosnan played Bond in four films. Critics of Craig have pointed out the actor is blond while James Bond has dark hair. But producers have defended their choice of Craig. "Once we started looking for someone, I really thought that Daniel would be the perfect guy and I think everybody will agree once they see the movie," said Barbara Broccoli, whose family own the franchise rights. "I think he's the right man for the job." Casting director Debbie McWilliams said that despite the criticism Craig had received there was still an enormous affection for the Bond character. "People are, thank goodness, in a way still incredibly interested," she said. "Virtually a day doesn't go by where we don't read something about James Bond in a newspaper and that can only be good for us I think."